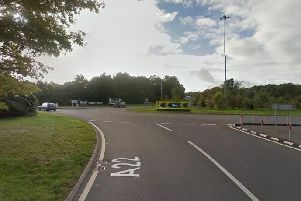 Police are investigating an incident at the junction of Seven Sisters Road and Jordans Lane East in Eastbourne in which a 12-year-old boy was attacked and bitten by a dog. It happened at approximately 5.20pm on Sunday (February 10) while the boy was riding his scooter past a jogger, who was accompanied by a black labrador-type dog on a lead. The dog launched itself at the boy and bit him on the chest, knocking him to the ground and lacerating his skin. He was later treated at Eastbourne District General Hospital. The dog and jogger made off in the direction of Hazelwood Avenue. The man was aged 25-35, 5ft 7ins tall, of slim build and possibly wearing a Brighton and Hove Albion football jacket. Anyone who saw what happened or who may have other information is asked to contact us online or by phoning 101, quoting serial 903 of 10/02.